Description: Commercial Water & Energy (CWE) had a dated website that looked stale and wasn’t picking up nearly any visitors through search engine traffic, so in 2013, they came to the website experts at DDA for a complete redesign and redevelopment of their site. 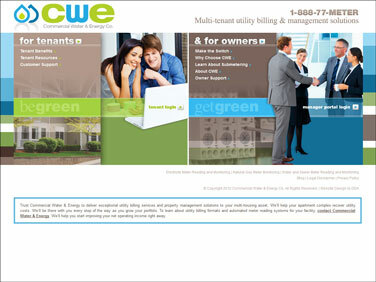 CWE wanted not only a new look and navigational architecture to make the site more appealing to visitors, they also wanted to ensure that they could actually reach out to the project managers, developers, and property owners of new and existing multi-tenant communities through their internet marketing efforts. The site would also include a portal for property managers in addition to a tenant portal for individuals to easily submit utility payments online. The website would also need to market the strengths of the organization to drive increasing client acquisition. DDA started by redesigning the logo, then creating a new graphic design to bring the visual appeal of the website into the new decade. These designs reflected CWE’s role in the delivery of both water and energy utilities. All content for the site was search engine optimized for an expansive list of search terms designed to increase traffic to the website, and DDA incorporated a blog into the site to allow CWE administrators to communicate information and announce networking events. The blog’s social media features help to disseminate information about the company virally. DDA launched the new CWE site in time for two upcoming trade shows, and CWE was proud to announce their new online platform through an email blast.